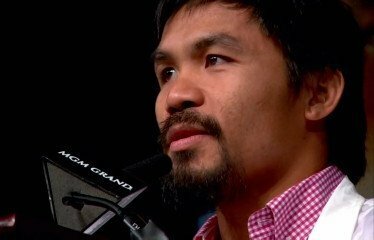 By Dwight Chittenden: Top Rank promoter Bob Arum has already penciled in his number #1 money fighter Manny Pacquiao for April 20th of next year against a still to be determined opponent. Arum scheduling Pacquiao ahead of time isn’t really anything new, but it is perhaps an indication that Arum isn’t all that interested in putting Pacquiao in with Floyd Mayweather Jr.
It’s either that or Arum just doesn’t think a fight between Mayweather and Pacquiao is attainable by that date. Arum would likely know, as it’s pretty clear that Pacquiao won’t be getting a 50-50 deal with Mayweather if they fight next year. Arum has always insisted that Pacquiao deserves nothing less than a 50-50 deal. But by setting a date in early 2013, you could interpret as a signal that Arum is trying to give Mayweather the brush off because this move will surely do. Okay, so Mayweather is out for that fight. Who does Arum have in mind? I think the choices are extremely limited. It would have to be among these fighters: Miguel Cotto, Lamont Peterson, Tim Bradley and Juan Manuel Marquez. The only reason I’ve added Marquez’s name is because if he beats Pacquiao in their fight on December 8th, while at the same time bringing in huge pay per view numbers on HBO, then I can see Arum pressing Pacquiao to fight him in an immediate rematch rather than letting Marquez get the victory and move off into the sunset. However, if Pacquiao beats Marquez in December, then it’ll be Cotto, Peterson or Bradley. The winner of the December 15th fight between Bradley and Peterson will be one of three final contestants for Pacquiao. While I’d like to see Pacquiao fight Cotto in a rematch, unfortunately that’s not going to happen with Pacquiao not interested in fighting at 154. Cotto won’t move down to 150 or 147, so it’s going to have to be Pacquiao that moves up in weight to take the fight. I don’t think Pacquiao will even consider that move. What will happen this is Pacquiao will face the winner of the Bradley-Peterson bout. I’m guessing it’ll be Bradley that Pacquiao will meet on April 20th. Pacquiao can then try and recapture his World Boxing Organization welterweight crown.